Its model number and name are #009 / Foot Ninja (Katana). Character Bio - Once a member of the Shirai-Ryu clan of Ninja, Hanzo Hasashi a.k.a. Scorpion was killed by the elder Sub-Zero (Bi Han) in battle while his whole family and clan were slaughtered by the menacing sorcerer: Quan Chi. 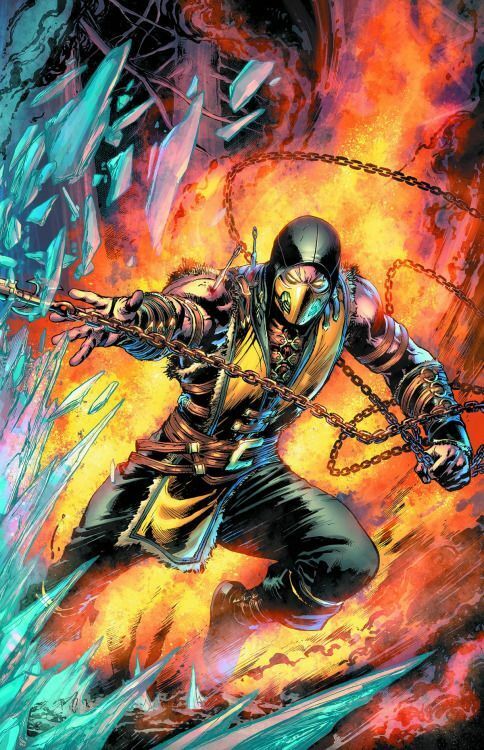 Scorpion returned, but as a Ninja specter. Quan Chi deceived Scorpion into thinking Sub-Zero was responsible for the death of his clan, thus Scorpion sought revenge for this tragedy. As a figure with a secret identity, Scorpion has these Secret Identity Synergies. As an Undead, Scorpion has these Undead Synergies. As a Ninja, Scorpion has these Ninja Synergies. As a figure with a secret identity, Scorpion interacts differently with these special powers. As an Undead, Scorpion interacts differently with these special powers. Tiny, large, and huge figures cannot be chosen for Scorpion's "Get Over Here!" special power. Last edited by Zettian Juggernaut; April 1st, 2019 at 06:30 PM. After moving and before attacking with Scorpion, if Scorpion is unengaged, you may choose one small or medium non-adjacent figure within 4 clear sight spaces whose base is no more than 8 levels above Scorpion's height or 8 levels below Scorpion's base. Roll the 20-sided die. If you roll 12 or higher, you may place the chosen figure on an empty space adjacent to Scorpion. After the figure is placed, you must roll the 20-sided die. If you roll 12 or higher, that figure receives 1 wound. You may add 1 automatic skull to your first attack against the chosen figure this turn but if you do, Scorpion may not attack again this turn. Figures placed by "Get Over Here!" do not take leaving engagement attacks. Add 1 to Scorpion's "Get Over Here!" roll for each Unique Hero you control with one or more wounds and 1 for each destroyed Unique Hero in your army, up to a maximum of +4. After attacking an adjacent figure with Scorpion, if you rolled at least one blank you may place him on any empty space within 3 spaces of his original placement and attack one additional time. When Scorpion starts to Teleport, he will not take any leaving engagement attacks. Last edited by Lazy Orang; March 13th, 2019 at 02:32 PM. Start with the Foot Ninja heroclix. Cut off the swords, making sure to cut them as close to the hands as possible to get the most substance out of them as we'll be putting them on Scorpion's back. Set the swords aside, blades and handles. Paint the skin over his upper face and his arms and hands to match. Add in the yellow for his outfit. Add the black for the arm guards, black over the black areas of his outfit, and you can put some marks on his mask if you feel like it. Add white for the eyes. Finally, glue the swords crossing on his back. Last edited by Arkham; August 18th, 2018 at 11:31 AM. Looking good. I think this should move to testing fairly quickly as I'd imagine that's the biggest thing we'll need hashed out is how he performs in relation to his point cost. Cool! If you don't mind, I might ask you to tackle the bio here - I normally like doing them, but I'm aware you're more aware of the story and narrative core of the character than I am. @dok , @Dysole , @Soundwarp SG-1 , @weebaer . Doubt he'll come in that low, but the design looks cool. I'm happy with him going higher. As far as I'm concerned, with Sub at 230, this guy could theoretically go as high as 220 without issue. You’re basing that on what? The fact you've consistently described him as not quite on Sub-Zero's level, but still pretty damn good? Note that I'm not saying that 220 is what I'm aiming for, more that that's what I'd consider his thematic ceiling. I’ve posted where he should be. For someone who usually is very adamant about a character being at a specific point value, even if a matter of 10 points, I’m surprised you’re gung ho about Scorpion’s flexibility. I gave you point estimates from the most diehard MK lore fanatics, and they had Scorpion a couple levels below Sub-Zero. Regardless, we’ll see what happens. A bit pointless until we see data. The whole points and theme discussion is a bit tired and quite inconsistent. I'd drop his base defense by 1 in an effort to keep him in the 200 or lower range. The teleport power should make it easier for him to collect the high ground bonus on defense fairly often, with the chain grab pulling those who do get the high ground on him down to his level or below him as well. So a base 4 defense should turn into 5 quite often, and 5 def. with 6 life is pretty solid.